FINE APPEARANCE. 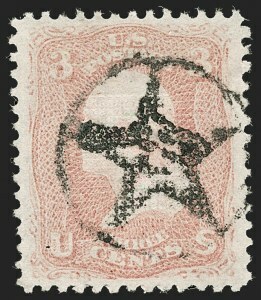 AN EXTREMELY RARE AND DESIRABLE ORIGINAL-GUM EXAMPLE OF THE 1868 2-CENT D GRILL. 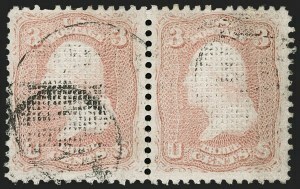 THIS IS A RARE STAMP WITH ORIGINAL GUM AND IS EVEN MORE DESIRABLE SHOWING A SPLIT GRILL. THIS IS THE ONLY UNUSED EXAMPLE WITH SPLIT GRILL WE HAVE OFFERED IN AT LEAST 25 YEARS. Our computerized records go back to 1994, plus our Rarities sales and select name sales back to 1966. During that time, we have offered only two used example of Scott 84 with split grill, plus a pair on cover in our recent auction of the Faust collection. 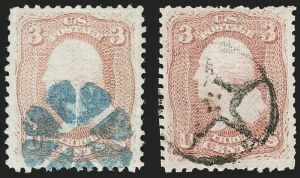 The Metzger collection did not have any, and the Rorke collection had one used with perfs significantly in on two sides. 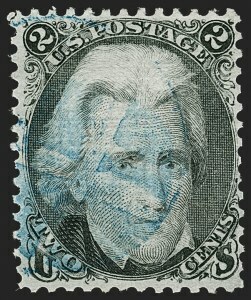 A Power Search review will also demonstrate how rare this is as an original-gum stamp, regardless of the variety. The example offered here, with full original gum, the sheet selvage, the split grill and a small fault, is very desirable. VERY FINE APPEARANCE. 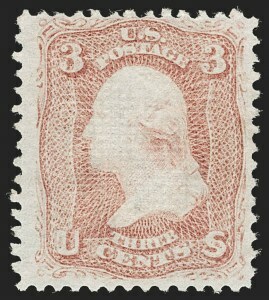 A SCARCE ORIGINAL-GUM EXAMPLE OF THE 1868 2-CENT D GRILL. THIS IS AN EXTREMELY DIFFICULT ISSUE TO OBTAIN WITH ORIGINAL GUM AND ANY SEMBLANCE OF DECENT CENTERING. 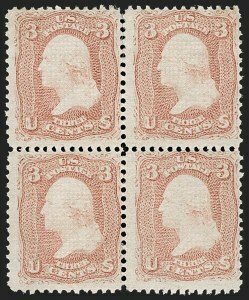 A Power Search review (sort Scott 84 results by prices realized to see the nicest copies) demonstrates how difficult this is to find with original gum and decent centering. The finest examples are contained in the intact block of four, ex Caspary, Lilly, Klein and Faust. This stamp will look far better on an album page than most. 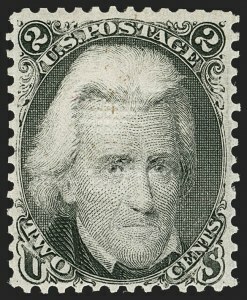 THIS IS THE ONLY RECORDED USED BLOCK OF THE 1868 2-CENT D GRILL. A GREAT RARITY OF THE GRILLED ISSUE. FINE-VERY FINE. 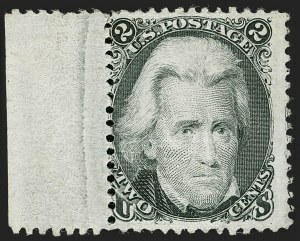 THE 1868 3-CENT D GRILL IS ONE OF THE MOST DIFFICULT GRILLED ISSUES TO OBTAIN IN BLOCK FORM, AND IS MISSING FROM EVEN THE MOST ADVANCED COLLECTIONS. THIS IS THE ONLY BLOCK WE HAVE OFFERED IN MORE THAN 25 YEARS, AND IT IS PROBABLY THE FINEST IN EXISTENCE. It is our hypothesis that two grilling machines were used to make regular-production grilled stamps, beginning in January 1868. Based on our analysis of grill production, the D Grill machine was refitted with the E Grill on or about February 2, 1868. Based on the earliest known uses of the 3c D Grill (2/1/68) and 3c E Grill (2/12/68), it is our theory that the conversion from the D to E Grill took place very soon after sheets of 3c stamps were first run through the D-equipped machine. This would explain the scarcity of 3c D Grill stamps. Our records contain only three unused blocks. The block of six has perfs strongly in at right and has faults. 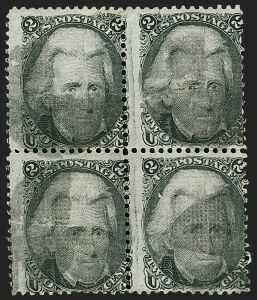 We offered a block of four in our 1966 Rarities sale, but it may no longer be intact. We cannot determine whether these two have gum. The block offered here is ex Lilly and last appeared in our 1991 Rarities sale. No blocks were contained in Caspary, Klein, Ishikawa, Zoellner, Whitman or other major name sales.